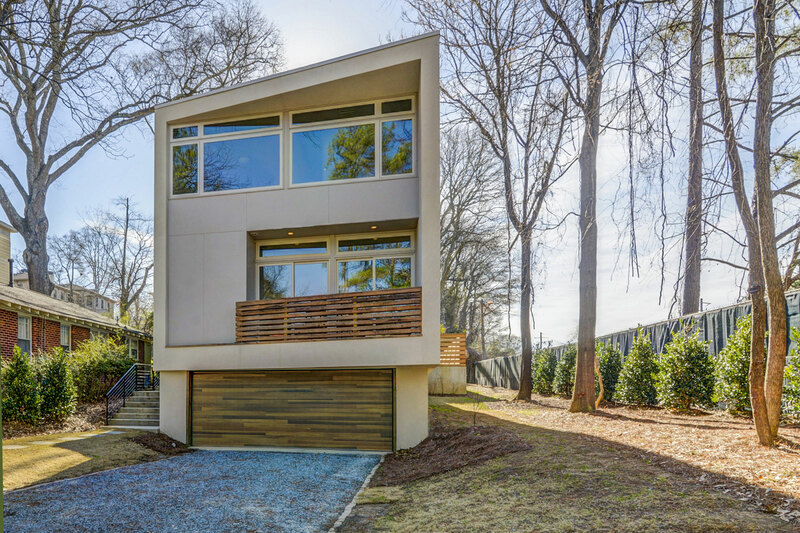 Located in Atlanta’s Old Fourth Ward district, this single-family spec house is designed for a deep and narrow lot that slopes up 12 feet from the street. Similarly sized lots are located along Belgrade Avenue to the east, and a low-rise commercial development and the Atlanta Beltline lie a short distance to the west. The rising slope of the site provides prominent western views of the downtown Atlanta skyline. 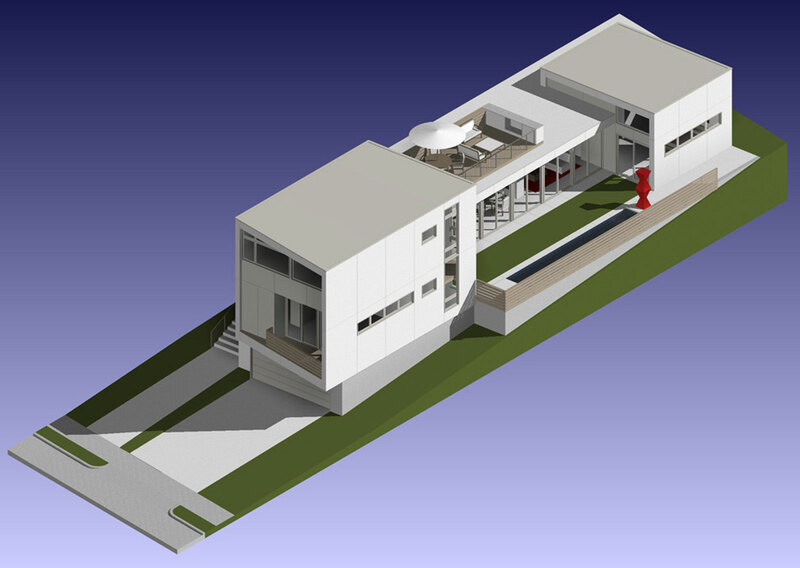 Throughout the Fourth Ward district, lot dimensions and zoning regulations often lead to a familiar house design: a two story box in the middle of the property with living space on the first floor, bedrooms on the second and front and back yards. A garage in the back and a driveway along one side leave little room for private outdoor living space. The Belgrade House takes a different approach. 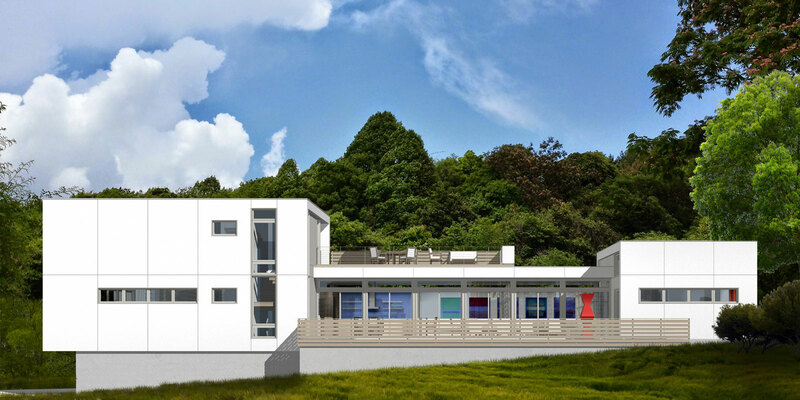 Utilizing the full dimension of the lot’s buildable area and the natural slope of the land, the 4-bedroom house features private, outdoor living space on an elevated plane at the heart of the site. 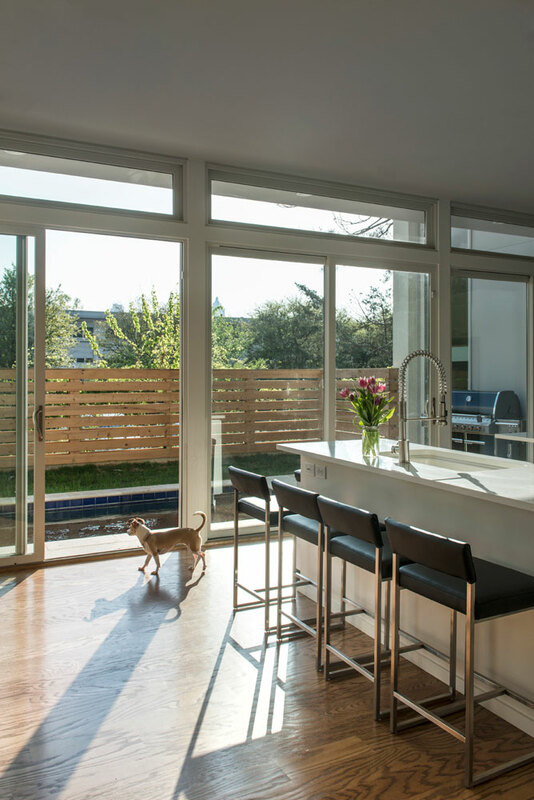 The courtyard becomes an extension of the home’s primary living spaces with wall-to-wall windows and doors that span the length of the kitchen, dining and living rooms. 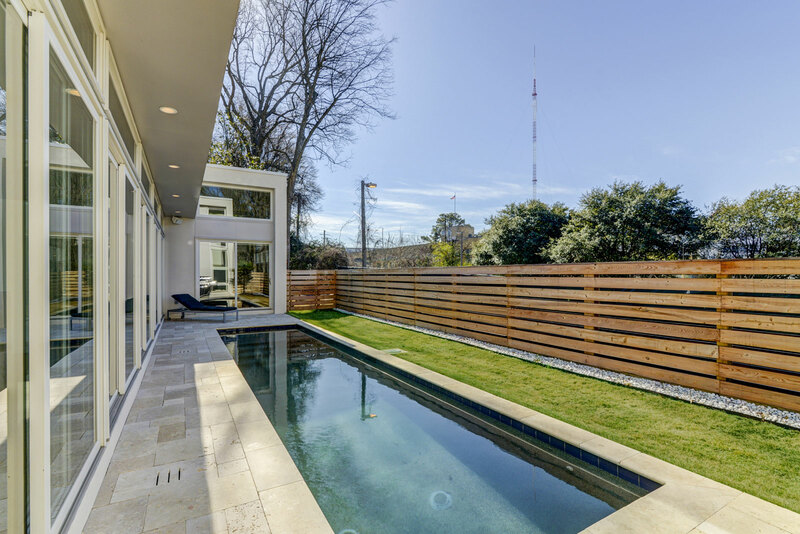 A rooftop terrace located directly above the first floor living spaces provides additional outdoor living area with spectacular views of Atlanta’s downtown skyline. The bedrooms are positioned on either end of the central living spaces. The master bedroom suite occupies the south end of the site and shares views of the courtyard. On the opposite side, a two-story bedroom volume containing the first floor guest room and two second-floor bedrooms faces Belgrade Avenue to the north. 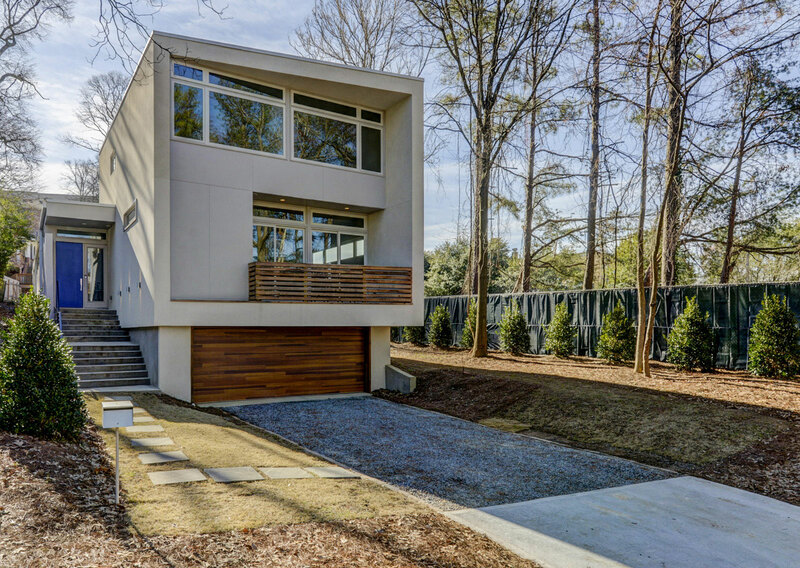 The elevated first floor allows privacy from the street and provides space for a ground level garage below. 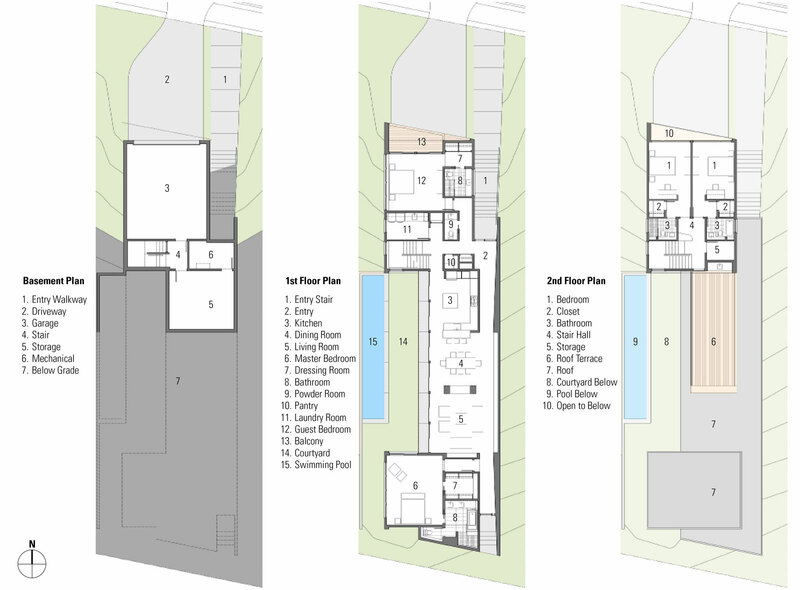 The plan diagram (open living space flanked by private bedrooms) is echoed in the design’s massing and use of materials. The bedroom volumes are defined with solid stucco sidewalls and end walls of fiber cement panels and glass. A floating roof connecting the two bedroom volumes defines the first floor living and circulation areas. 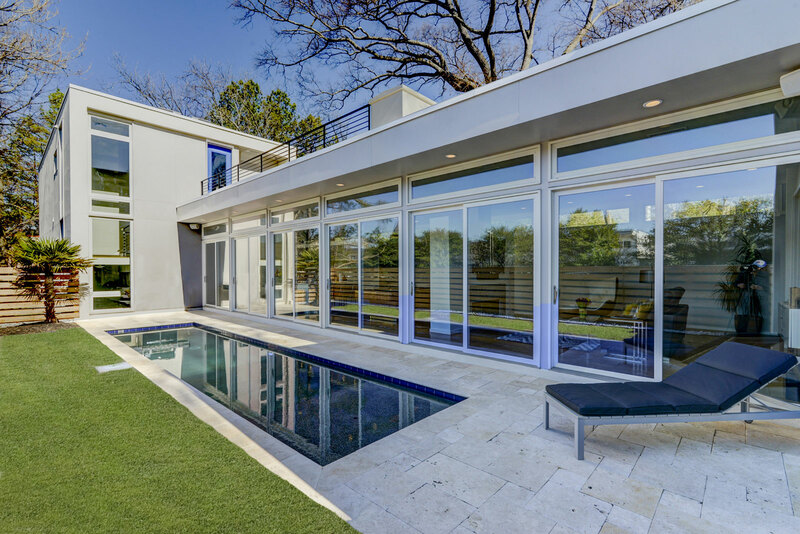 Floor to ceiling glass doors and windows connect the living space to the courtyard, and a solid wall of tapering thickness defines the entry as it shields the living space from the adjacent property.